In addition to using black to indicate what's hidden and white to indicate what's selected, you can paint with shades of gray to indicate partial transparency. For example, if you paint in a channel with a shade of gray that is at least halfway between white and black, the underlying image becomes partially (50% or more) visible. You'll experiment by adding a gradient (which makes a transition from black to gray to white) to a channel and then filling the selection with a color to see how the transparency levels of the black, gray, and white in the gradient affect the image. 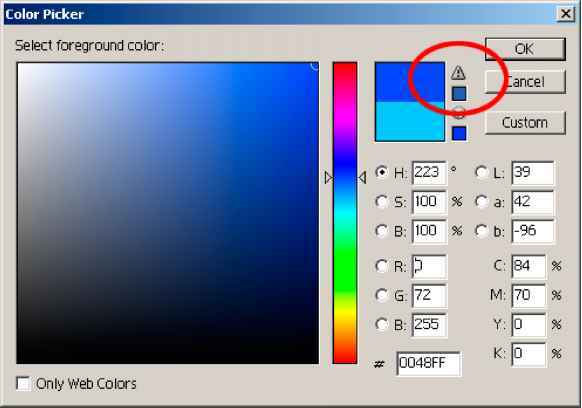 1 In the Channels palette, create a new channel by clicking the New Channel button (j) at the bottom of the palette. The new channel, labeled Alpha 1, appears at the bottom of the Channels palette, and the other channels are hidden in the image window. 2 Double-click the Alpha 1 channel and type Gradient to rename it. 3 Select the gradient tool (_i). 4 In the tool options bar, click the arrow to display the Gradients picker and select the Black, White gradient. 5 Hold down Shift to keep the gradient vertical, and drag the gradient tool from the top of the image window to the bottom of the window. The gradient is applied to the channel.